This was quite yummy. 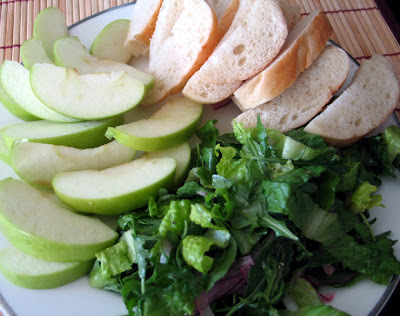 I made just one to share and had bread and apple slices for dipping/spreading. You can probably use whatever you like. It called for a tomato and basil salad thing. I skipped that and just made a simple salad. I will include that in the recipe. Here is my modified version that served two. I got the grill heating before I started the salad, since the salad was so fast. Mix lemon juice and olive oil. Toss with greens and onions. Salt and pepper to taste. 1 small round of camenbert or brie. It MUST be totally incased in the rind. Put grill pan on barbecue rack and heat barbecue to high. Rub all sides of the cheese round with olive oil to coat. 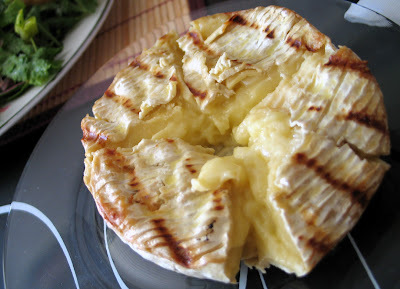 Place cheese on hot grill pan and let cook for about 5 minutes. Using a flat spatula, carefully flip cheese over. Grill about 5 more minutes on the second side or until cheese starts to feel soft and runny when you squeeze it with tongs. This is where I was overly cautious. I ended up with mostly soft cheese, but it could have gone a little longer. I was worried about it getting too soft and breaking open. So I took it off a little too soon. My fix? I nuked it for less than a minute with the rind still intact. To serve, cut open the top of the rind and dip! I especially liked the apples. I think it would be good with slightly steamed then cooled asparagus spears, too. And of course, the bread was good. The salad was not for dipping. It did provide a nice bright flavor in contrast to the creamy, creamy cheese. I made this for two. But as an appetizer it probably would work for four depending on the size of the cheese round. I would be leery of doing a round that is too large since it may take too long to melt before the rind starts to break down on the grill.